Your driving test examiner will ask you two questions – one show me question and one tell me question. You don’t need to be a mechanic to answer the show me, tell me questions correctly, you just need a good knowledge of your vehicle and the ability to carry out the ‘show me’ question on the move without losing control of your vehicle. Check vehicle handbook for recommended pressures. Then using a pressure gauge, check and adjust pressures when tyres are cold, don’t forget spare tyre, remember to refit valve caps. The head restraint should be adjusted so the rigid part of the head restraint is at level with the eyes or top of the ears, and as close to the back of the head as is comfortable. Explain you’d operate the switch then walk round vehicle (as this is a ‘tell me’ question, you don’t need to physically check the lights). A yellow ABS warning light will come on. Explain you’d operate the hazard warning switch and then walk round vehicle checking that all SIX bulbs are flashing. Explain you’d turn on the ignition (NOT engine) then operate the brake pedal, make use of reflections in windows or doors, or ask someone to help. With engine off apply gentle downward pressure on the steering wheel with left hand. You can tell power steering is not working. When engine is started you should feel the power steering ‘kick in’. Turn on dipped headlights and ignition. Press button on right of light switch. Check amber warning light is on. Say you’d use them when visibility drops below 100 metres (328 feet) – roughly the length of a football pitch – in fog or falling snow (NOT heavy rain) and switched off when visibility improves. 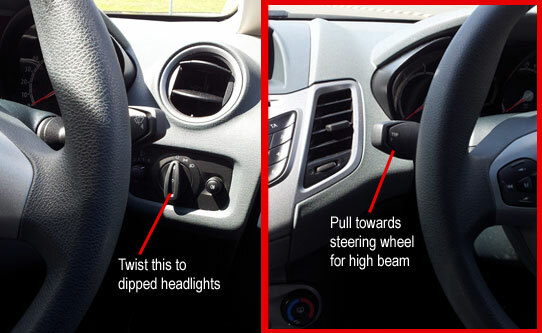 Turn on headlights then pull main beam switch (it’s the direction indicator stalk) towards you until it clicks. Check main beam warning light – blue. Identify dipstick/oil level indicator, say: I’d take the dipstick out, clean it, put it back, take it out again and make sure oil is between maximum and minimum marks. Identify high and low level markings on header tank and describe how to top up to correct level. When the engine is cold – very important.